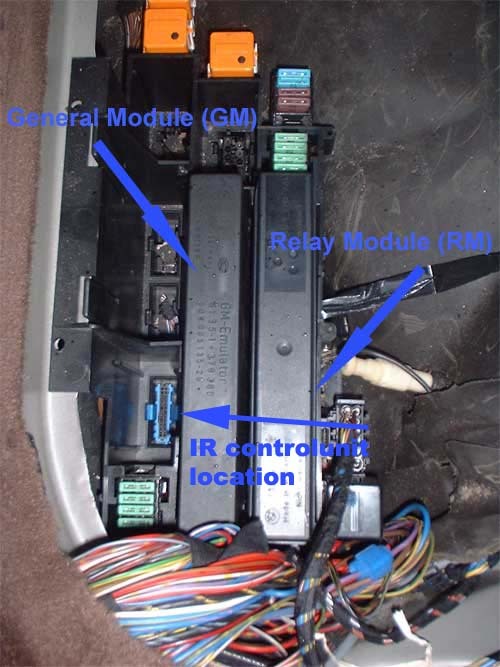 Here's a quick bit on upgrading your car's General Module. All E32/E34 use a centralized General Module to control most interior functions. Later E32/E34 cars, anything built after 9/91, have an updated module that tweaks some interior features and adds one touch down functionality for all windows. You can add these features to your early car by swapping your existing module with one from a later car. All US E32/E34 general modules are physically interchangeable, though there are some compatibility issues with certain cars/modules. You will run into lock functionality problems if you install a late E34 GM into an early E34 car (or a late E34 GM into an early E32, has to be from a late E32). The locking system has to match that of the donor car. The installation process is simple. First disconnect the battery and remove the back seat lower cushion (pull UP, hard, at the front edge). With the cover removed, the GM is located on the left. Be sure your battery is disconnected before you remove it. It pulls up and out. Fit the replacement module and reassemble the car, reconnect the battery and enjoy! Last edited by Kalevera; 07-05-2010 at 06:05 PM. Repeat and time interlock for headwashers, time interlock 3 min. -previously the GM would react opposing signals (e.g. an unlock signal while trying to lock, as with a defective microswitch) by carrying out the first command (e.g. locking, followed immediately by unlocking). Repeating the first command then results in carrying out the command, e.g. try to lock again, and locking is now carried out. This function (Asynchronious Position) is omitted in the NEW GM. -After unlocking is performed due to crash sensor activiation, the locking command is now reactivated by double-locking with the key from either side (driver or passenger door). -Sunroof is not already in the tilt position. -switch off delay of the interior lights after entering the vehicle and closing the driver's door reduced from 20 to 15 seconds. Shogun, what does sunroof is not already in the tilt position mean?